Obesity-linked changes in the function of HDL – the “good” cholesterol – may increase the risk of coronary heart disease, but how obesity impairs HDL function is not well defined. 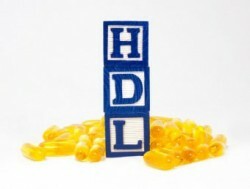 John Stafford, assistant professor of medicine, and colleagues studied HDL composition in transgenic mice expressing CETP, a triglyceride-cholesterol shuttle protein that regulates HDL composition but is normally absent in mice. They report that after ovariectomy (to induce menopause and its associated metabolic changes), CETP mice fed a high-fat diet had accelerated weight gain and impaired glucose tolerance compared to those fed a low-fat diet. The high-fat diet also changed HDL composition, increasing levels of proteins involved in triglyceride metabolism. The findings, reported in the March Journal of Lipid Research, suggest that the absence of ovarian hormones negatively impacts the response to a high-fat diet in terms of glucose tolerance and HDL composition. The studies also suggest that the CETP mice may be a useful model for defining how metabolic changes affect HDL composition and function. This research was supported by the Department of Veterans Affairs, the American Heart Association, Atlantic Philanthropies, Inc., the American Diabetes Association, the John A. Hartford Foundation, and the Association of Specialty Professors. The National Institute of Diabetes and Digestive and Kidney Diseases and the National Cancer Institute of the National Institutes of Health also supported the studies.